Does intake of bread supplemented with wheat germ have a preventive role on cardiovascular disease risk markers in healthy volunteers? A randomised, controlled, crossover trial. Objective Intake of whole grains is associated with a reduced risk of cardiovascular disease (CVD). This evidence is also strong for bran alone, but findings about germ are conflicting. Our aim was to elucidate the role of germ in primary prevention of cardiovascular events, and therefore, a staple food was selected for 6 g of germ supplementation. This corresponds to sixfold increase in the global mean consumption of germ, while preserving the sensory proprieties of refined bread which is crucial for consumer’s acceptance. 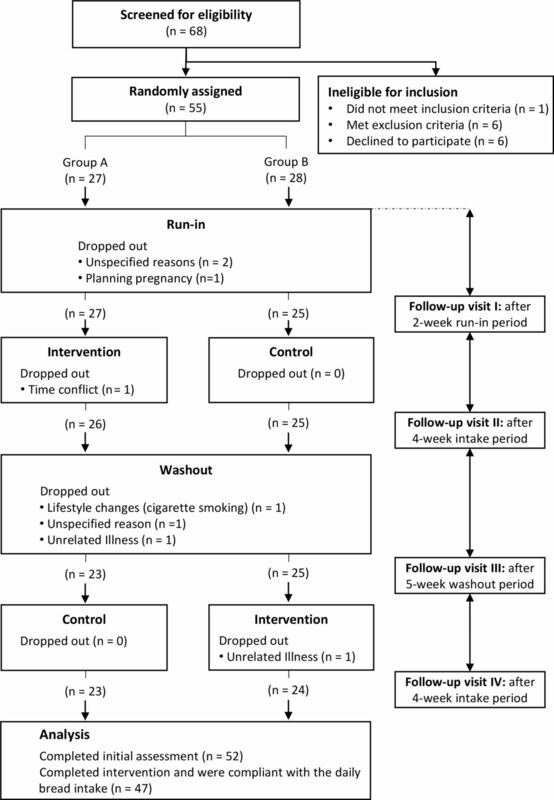 Design Randomised, double-blinded, crossover, controlled clinical trial with 15-week follow-up comprising a 2-week run-in, two intervention periods of 4 weeks each and a 5-week washout period. Setting A single centre in the north of Portugal. Participants 55 eligible healthy adults (mean age of 34 years and body mass index between 19 and 38 kg/m2) were randomly assigned. Interventions The study consisted of two intervention periods including daily intake of refined wheat bread enriched with 6 g of wheat germ and control (non-enriched bread). Outcomes Changes in fasting cholesterol and triglycerides, fasting and postprandial glucose, insulin sensitivity and C reactive protein. Results We observed no significant effect of daily intake of wheat germ on cholesterol and triglycerides levels, on postprandial glucose response and on insulin sensitivity. 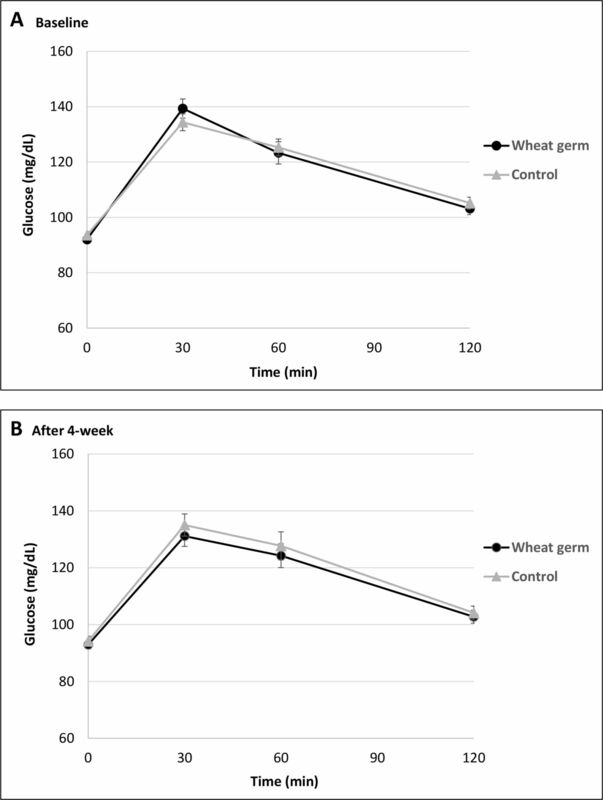 Incremental area under curve glucose and homeostasis model assessment for insulin resistance did not change, suggesting that 6 g of wheat germ have no effect on glucose metabolism. No effect was also observed in the subgroup of participants who complied with the protocol (n=47). Conclusions The absence of alterations on lipid and glucose profiles suggests that germ up to 6 g/day may have no preventive effect on CVD risk. However, it is important to investigate other food vehicles that can accommodate higher doses of wheat germ in future studies. This study followed the best practices for designing, conducting and reporting clinical trials to support health claims on food products, namely random allocation, double blinding, reporting methods to measure and maximise compliance. We used validated outcomes which are considered beneficial physiological effects for human health. To the best of our knowledge, this is the largest study to assess the impact of germ intake in human subjects. Although compliance was high, it is uncertain whether this is due to over-reporting, since there is no biomarker for wheat germ intake. A longer intervention period would be desired for evaluating an effect on lipoprotein cholesterol, nonetheless could have a major impact on loss to follow-up in this crossover study. Dietary guidelines around the world recommend 85 g daily intake of whole grains,25 which contains nearly 2.6 g of germ. However, their daily consumption is far below the recommendations and consumers prefer highly refined products.26–28 In fact, supplementation with whole-grain ingredients is therefore an elegant way to overcome consumer’s preferences while it contributes for public health, as long as these ingredients are indeed beneficial. Clarification of the physiological effects of germ is needed. However, fortification of food products with germ is challenging because germ becomes rancid very rapidly due to high content in unsaturated lipids together with lipases and lipoxygenases,29–31 and it also negatively affects the sensory properties of the final food product.32 Thus, in order to address these specificities, germ stabilisation33 is necessary immediately after milling to inhibit enzymatic rancidity, while the percentage of germ in the final product should be tested whether long-term consumer acceptance is desired. In this context, we designed a randomised, double-blinded, crossover, controlled clinical trial targeting the general population, in order to evaluate the physiological and metabolic effects of germ intake in a dose higher than the amount reported in the previous prospective studies, wherein no preventive CVD effect was demonstrated. The impact on CVD metabolic risk factors of daily consumption of 100 g of refined wheat bread enriched with 6 g of wheat germ during 4 weeks is here presented. The study protocol was approved, and all participants provided written informed consent. The clinical trial was conducted from June 2015 to October 2016, in accordance with ethical principles of the Declaration of Helsinki, international law and Good Clinical Practice guidelines. This study is registered in ClinicalTrials.gov database, reference NCT02405507, and followed the CONSORT reporting guidelines (see online supplementary table S1). Before recruitment, volunteers that did not participate in the study were invited to be involved in the development of the bread formula used in this trial. They had no role in setting the research question, the outcome measures, the design or implementation of the study. We included inputs from the participants of the study, namely any burden associated with the procedures, throughout the follow-up in order to optimise their involvement and compliance. Participants were involved in the sensory evaluation of the study breads, as well as in the recruitment process by encouraging others to participate. On publication, participants will be informed of the results of this study through direct email. Our study was a 15-week, randomised, double-blinded, crossover, controlled clinical trial. The trial comprised four stages: a run-in period (2 weeks), two crossover intervention periods (4 weeks each) and a washout period between interventions (5 weeks). At the end of each stage, blood samples for measurement of plasma cholesterol (total, low-density lipoprotein (LDL) cholesterol and high-density lipoprotein (HDL)), triglycerides, C reactive protein (CRP) and postprandial glucose were collected from each study participant as primary outcomes. Blood samples were also collected for measurement of fasting glucose and insulin as secondary outcomes (see online supplementary figure S1). Primary and secondary outcomes related with gastrointestinal discomfort were also evaluated in this trial; however, they will be reported later. Participants were instructed not to change their physical activity levels, maintain their dietary habits and do not consume any food or dietary product supplemented with germ during the study. Compliance to the study protocol (daily consumption of bread) was monitored through daily self-reported questionnaire, since there is no biomarker for wheat germ intake. Participants were randomly assigned into two intervention groups (ratio 1:1) using a computer-generated allocation sequence by a statistician not involved in recruitment and intervention delivery. The intervention arm comprised the daily consumption of wheat bread (100 g) supplemented with wheat germ (6 g), whereas the control arm involved the daily intake of wheat bread (100 g) without any supplementation. The bread provided to participants replaced their usual bread intake during meals, namely during breakfast or afternoon snack. The participants and the research team were blinded to the study breads (intervention/control). In this regard, we previously tested the best formula that masked wheat germ supplementation, in terms of bread texture, volume and flavour. Moreover, the bread was delivered to each participant in opaque bags with a label code (A/B); only the outsourced company responsible for bread production (Padaria Ribeiro Lda., Portugal) knew the correspondence code. The unblinding was performed after the statistical analysis had been completed. Control breads were prepared by mixing 6 kg refined wheat flour (Germen S.A., Portugal) with 3.3 L water, 97 g of salt, 60 g of bread improver mix (Germen, S.A., Portugal) and 180 g of baker’s yeast. The mixture then fermented for 15 min at room temperature. Dough was divided and moulded into pieces (123 g each), and then placed in a fermentation chamber with 80% relative humidity for 60 min at 30°C. Finally, baking was done at 190°C during 20 min. Preparation of intervention bread was similar to control bread; 480 g of refined wheat flour was replaced by raw wheat germ (Germen S.A., Portugal) only. Nutrient composition of control and intervention breads was analysed by Silliker Portugal, S.A. (Mérieux Nutrisciences Corporation). Of 68 subjects screened to assess eligibility to participate in the study protocol, 55 were randomly assigned: 27 to the intervention– control sequence and 28 to the control–intervention sequence. Fifty-two participants completed an initial assessment and were included in the statistical analysis (figure 1). Eight individuals dropped out: three did not wish to continue the study for unspecified reasons, three declined to participate due to personal reasons (see figure 1) and the last two because of unrelated illness (gastroparesis and pneumonia). Study participants were healthy men and women, with a mean age of 34 years (range: 18–59 years), and body mass index (in kg/m2) between 19 and 38 (34 normal weight, 14 overweight and four obese). All participants had normal fasting glucose and normal glucose tolerance. At baseline, 42 had normal fasting total plasma cholesterol (<200 mg/dL), eight had borderline-high fasting total plasma cholesterol (200–239 mg/dL) and two had high fasting total plasma cholesterol (>240 mg/dL). Fifty participants had normal fasting total plasma triglycerides (<150 mg/dL) and two had high fasting total plasma triglycerides (200–499 mg/dL). Test results for haemoglobin and for liver function showed no evidence of ill health. Baseline characteristics of the 52 study participants that were included in the intention-to-treat statistical analysis are listed in table 1. Flow chart of participants through the study. Daily questionnaires revealed good compliance to the study protocol. The daily consumption of bread was assessed and the average compliance was 92.1%±9.3 and did not vary depending of bread type. Intervention and control arm had the same percentage of compliance: 92.2%±11.1% and 92.0%±10.0, respectively (p=0.920). None of the participants reported adverse effects. The content of protein and dietary fibre was higher in the wheat germ-enriched bread (9.6% and 7.5%, respectively), whereas control bread had a higher content of carbohydrate and starch (5.5% and 6.0%, respectively). The content of fat and energy are comparable in both breads. As expected, the quantity of total phytosterols and alpha-linolenic acid was 73.3% and 41.7% higher in the intervention bread, respectively (table 2). There was no statistically significant difference between wheat germ-enriched and control breads, after 4-week intake, for cholesterol (total, LDL and HDL) and serum triglycerides (table 3). No difference was also observed for those participants who completed the outcome measures and complied with the daily bread intake between wheat germ-enriched bread and control bread (n=47; total cholesterol: p=0.797, HDL cholesterol: p=0.996, LDL cholesterol: p=0.665 and triglycerides: p=0.762). The same result was obtained when participants with normal fasting total plasma cholesterol and triglycerides are analysed (n=41; total cholesterol: p=0.981, HDL cholesterol: p=0.413, LDL cholesterol: p=0.833 and triglycerides: p=0.718). The results were not statistically different when participants with borderline or high fasting total plasma cholesterol were included (n=10; total cholesterol: p=0.432, HDL cholesterol: p=0.170, LDL cholesterol: p=0.781 and triglycerides: p=0.508). Statistical analysis of blood lipid outcomes showed no interaction between intervention and sequence, potentially excluding a carryover effect. There were no significant changes in postprandial glucose peak values (at 30 min) after 4-week consumption of wheat germ-enriched bread (−5.13±3.03 mg/dL; p=0.097) or control bread (2.35±3.73 mg/dL; p=0.531), and neither between interventions (p=0.182). Blood glucose response curves for 2 hours after the intake of intervention and control breads are shown in figure 2. Mean±SEM postprandial glucose concentrations in response to a 100 g wheat germ-enriched bread or control bread, at baseline (A), and after 4 week intervention (B). No significant effect in the incremental area under the curve was observed between wheat germ-enriched and control breads (p=0.524). Comparing with control, wheat germ-enriched bread had no significant effect on IAUC glucose, fasting insulin or HOMA-IR (table 3), suggesting that 6 g of wheat germ did not improve postprandial glycaemia or glucose metabolism. No differences in CRP were observed between wheat germ-enriched and control breads. CRP and glucose results are not statistically different when only participants who adhered to the study protocol were analysed (n=47; IAUC: p=0.597, insulin: p=0.709, HOMA-IR: p=0.597, and CRP: p=0.959). In the present study, we evaluated the health effects of wheat germ intake in 52 healthy individuals. Blood lipids (cholesterol and triglycerides), fasting and postprandial glucose, CRP and insulin were evaluated during 15 weeks in a randomised crossover design. The results presented show that the intake of 6 g/day of wheat germ for 4 weeks has no effect on cholesterol and triglycerides levels, on glucose metabolism, namely in IAUC glucose, and on insulin sensitivity (HOMA-IR). Thus, our findings strongly suggest that wheat germ by itself has no impact on the cardiovascular risk factors evaluated and, thus, a beneficial physiological effect of wheat germ up to 6 g/day, by decreasing the risk of CVD in normal adults, is unlikely. Six grams of wheat germ intake per day corresponds to 2.4-fold increase in the germ present in the daily recommendation for whole grains intake and to a sixfold increase in the global mean consumption of germ. In this study, we elucidated the role of germ in the primary prevention of cardiovascular events, and for this, we tested and developed a wheat germ-enriched bread without compromising the nutritional status (table 2), texture and flavour (see online supplementary table S2). Importantly, besides allowing blinding and the analysis of the effect of added germ individually, this no-difference is crucial for consumer’s acceptance if this is envisioned as a long-term goal. Bread was chosen as vehicle for germ intake because it is a staple food, major contributor to carbohydrates intake, whereas the wheat is globally a staple grain. Up until now, the beneficial effect of wheat germ in lowering blood cholesterol and triglycerides was only demonstrated when used as a diet supplementation with 20 g24 or 30 g/day23 during 4-week periods. Incorporation of such high proportions of wheat germ in food products, without impairing their nutritional profiles, is difficult since germ changes their sensory proprieties. Our study is the first interventional study evaluating the effect of wheat germ in higher doses than the global mean consumption of germ and higher than the germ present in the recommended doses of whole grains. This intervention is a randomised, double-blinded, controlled clinical trial that uses a functional food product as supplementation vehicle, and not a dietary supplement. Our study followed the best practices for designing, conducting and reporting clinical trials to support health claims on food products, namely random allocation, double blinding, reporting methods to measure and maximise compliance. The strength of the current study also includes the use of validated outcomes which are considered to be beneficial physiological effects for human health.34 Finally, to our knowledge, this is the largest study to assess the impact of germ intake in human subjects and, importantly, targets the general population instead of a high-risk group. The limitations of this study include the duration of the intervention period. Although 4 weeks is considered the minimal intervention for evaluating an effect on lipoprotein cholesterol, 8 weeks would be more desirable; however, such intervention period in a crossover study could have a major impact on loss to follow-up. Second, the absence of a biomarker specific for germ intake is also a limitation; adherence was monitored through daily self-reported questionnaire and, though compliance with the study protocol was optimal, it is uncertain whether there was over-reporting. Third, the presence of carryover effects in the fasting glucose and HbA1c reduced the statistical power for these two outcomes, since the crossover design was not considered and only the first period was analysed. Lastly, we decided not to collect information about diet and physical activity levels during the study in order to avoid changes in general participants’ lifestyle and dietary patterns, and this could be seen as a limitation. In our study, we enrolled a moderately large and heterogeneous sample of participants which is representative of general population, with normal, borderline-high and high fasting total plasma cholesterol and triglycerides. The statistical power of this study is higher than preceding studies and, for that reason, smaller differences could be detected if they indeed existed. Thus, it is not plausible that the absence of any statistical significance on the wheat germ-induced changes is due to the lack of statistical power. However, the inexistence of wheat germ effects reported here does not necessarily disprove the potential cholesterol-lowering and triglyceride-lowering effect described in previous studies, in particular, because in those studies, wheat germ was consumed in higher doses and by individuals at risk. In our opinion, a dose–response analysis for wheat germ intake and lipid profile should be investigated in the future, for general population and high-risk groups. Effect of wheat germ in improving postprandial glycaemia or glucose metabolism was not demonstrated in our study, in accordance with previous studies. Earlier studies addressing the long-term impact of wheat germ on blood lipids of hypercholesterolaemic individuals did not observe any significant variation on fasting glucose, insulin, fructosamine and HbA1c24; and one single study with six healthy participants showed that wheat germ had no effect on postprandial glucose and insulin concentrations.45 Even so, we decided to investigate the impact of wheat germ on glucose metabolism because it was recently suggested that intake of alpha-linolenic acid has been associated with lower insulin resistance46 and our wheat germ enriched-bread contains more 41.7% of alpha-linolenic than control bread (table 2). In summary, our goal was to demonstrate the effect of a staple food supplemented with wheat germ in its maximal concentration without compromising its sensory properties. However, the intake of 6 g/day of wheat germ does not contribute to reduce the cardiovascular risk factors plasma triglycerides, total cholesterol, LDL cholesterol, or increase the HDL cholesterol levels, or even improve glycaemic control, in a generally healthy normal population. In order to justify an enrichment of food products with wheat germ as a public health approach to prevent CVD, the beneficial effects of wheat germ on human health should be investigated in other food vehicles that can accommodate higher doses of germ. Chemical and sensory proprieties of biscuits, noodles and cakes supplemented with increasing amounts of wheat germ (up to 30%) have been recently analysed and improved.32 47 48 These technological advances let us envisage that other food products functionalised with higher wheat germ content can be developed. Future studies following our clinical trial design are needed to elucidate if high amounts of daily intake of wheat germ are effective in reducing CVD risk. We thank Diana Sintra, Francisca Mendes and Sónia Norberto for their assistance during follow-up. We are also especially grateful to all subjects for their participation in this study.
. The glycaemic index: a physiological classification of dietary carbohydrate. Oxfordshire: CABI, 2006.
. Controlling the false discovery rate: a practical and powerful approach to multiple testing. Journal of the Royal Statistical Society: Series B 1995;57:289–300.
. Clinical Trials: A Practical Approach. Chichester, UK: John Wiley & Sons Ltd, 1983.
. Evidence for a proteinic inhibitor of pancreatic lipase in cereals, wheat bran and wheat germ. Nutr Rep Int 1985;32:1107–13. Contributors AM-R was partially responsible for study design, statistical analysis plan, carrying out the trial, manuscript writing and final revision. HP was partially responsible for study design, carrying out the trial, manuscript writing and final revision. CM collaborated in the study design, data collection and final revision of the manuscript. JAT collaborated in the study design and final revision of the manuscript. CC was responsible for the general coordination of the project, study design, manuscript writing and final revision. LFA was responsible for the general coordination of the project, study design, statistical analysis plan, manuscript writing and final revision. Funding This work was supported by the Programa Operacional Competitividade e Internacionalização–COMPETE2020 and by National Funds through Fundação para a Ciência e a Tecnologia-FCT (through the operations FCOMP-01-0202-FEDER-038861 and POCI-01-0145-FEDER-007746). Disclaimer The COMPETE2020 and FCT had no role in the design, analysis or writing of this article. Ethics approval Health Ethics Committee of São João Hospital Centre and the Ethics Committee of the Faculty of Medicine of the University of Porto. Data sharing statement The full data sets generated during and/or analysed during the current study are not publicly available because the ethics committee only allowed the use of the data in the context of the present research project; however, anonymised partial data sets or summaries of the data are available from the corresponding author on reasonable request.